AT the movies, in the beginning is always the word. And the word forming the foundation of director George Tillman Jr’s film is the debut novel by Angie Thomas. The film is a homage to Audrey Wells, who adapted the novel into the screenplay for this 133-minute film and died shortly after completing it. Amandla Stenberg plays 16-year-old Starr Carter, whose father Mav runs a small grocery in a black quarter of Atlanta. From an essentially middle-class family, Starr is the only black student at high school. Mav has trained his family about what they must do if the police ever pull over a car in which they are driving. Starr is in Khalil’s car on the night when it gets pulled over. They haven’t done drugs or drunk alcohol. But the cop shoots Khalil. As Mav’s brother, a cop, later explains to Starr, the cop was following procedure laid down for good reasons. Khalil’s death was a terrible mistake, but it sets in motion a growing turmoil that spills into the streets and divides the community. Starr endures the frustration that comes with being a member of the social group that the cops automatically regard as law-breakers. Initially, she refuses to tell how Khalil died. When she does give in to pressure, the grand jury fails to recommend prosecution. Tensions build up. Riots, black versus white, black versus police, stop traffic in convincingly-staged and drawn-out passages that resolve nothing. The screenplay focuses on the Carter family and Starr’s classmates. 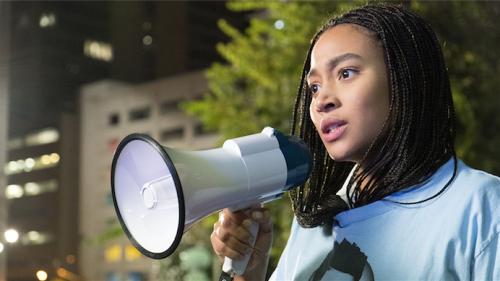 With her cornrow hair-do, Amandla Stenberg dominates the majority of the film’s shots. It’s a profoundly moving performance in a film with the chops to find itself under consideration this time next year as an Oscar nominee. It’s relevant, it’s credible and it’s an act of courage by the filmmakers and the community in which they made it. I wonder what Angie Thomas will write next.